GTF prides itself on high quality ingredients, making food from scratch, and preparing menus with respect for European traditions. Our dishes run a theme of peasant cuisine in Italy. Other times we make fettuccine noodles. Below, the long rectangle is cut into shorter rectangles. Aaron rolls up each short rectangle length-wise and uses a knife to cut it into thin strips. 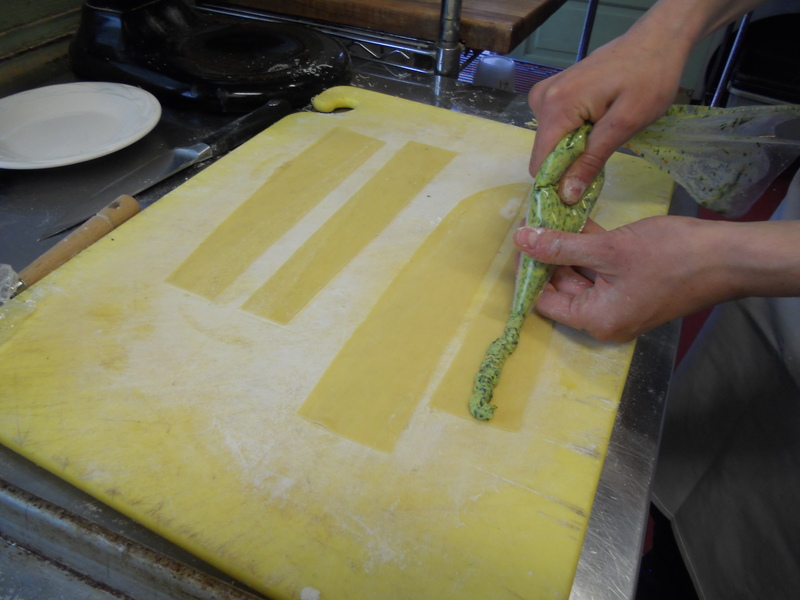 For ravioli, we use a fluted pastry cutter to make squares with grooved edges. In the photos below, an herb cheese filling has been tucked between two squares of pasta that were then sealed together. 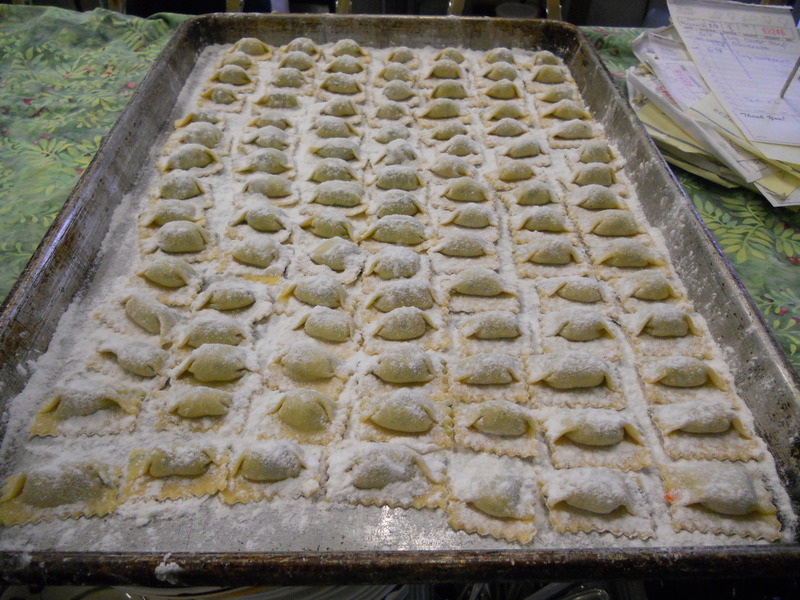 Shea delicately brings the corners of each ravioli together and trims off any excess dough. Finally she places them on a baking sheet and sprinkles a bit of flour over these little nuggets of goodness. We firmly believe that you’ll never leave a meal dissatisfied when our fresh pasta is involved. But you’ll just have to try it for yourself to know for sure. Getting ready for dinner service starting Thursday night. Sweet woodruff from JC’s backyard is infused into a cream sauce as the partner to carrots and caramelized shallots and chive blossoms. Every single portion we served today left the kitchen with a huzzah! Our old friend brodetto made even sweeter and richer by new potatoes. Shea makes the pasta so perfectly, it is hard to believe it’s not from a machine. 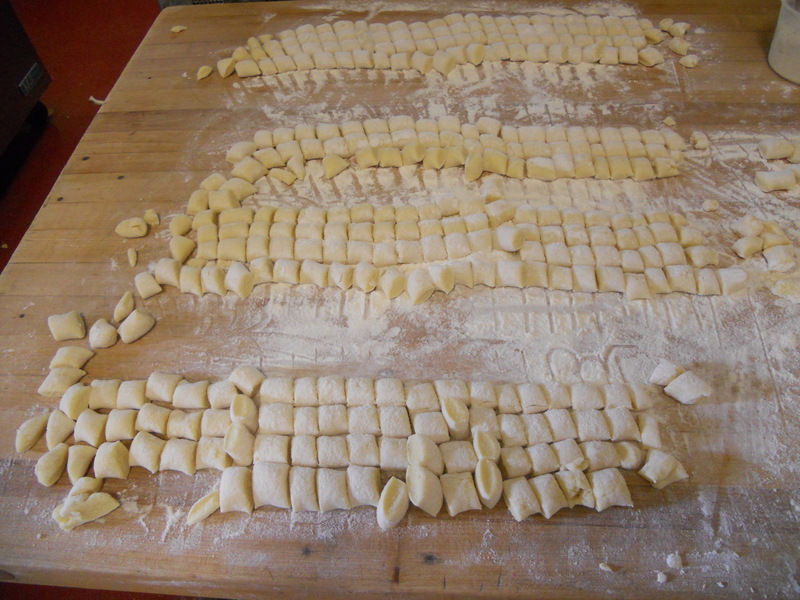 I thought I would give photographic proof that we make the pasta in house.